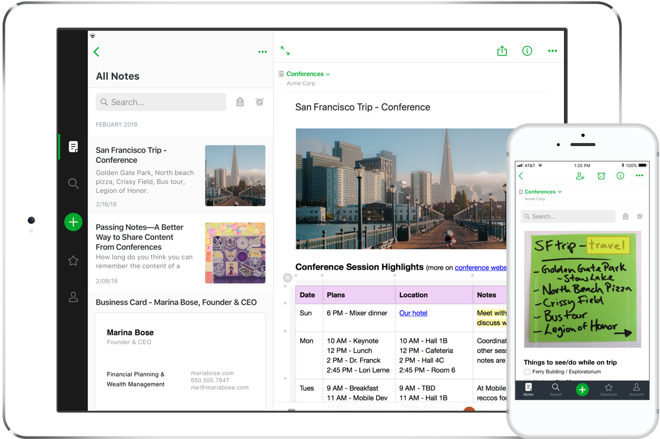 Productivity app Evernote has made a major reduction to its workforce, eliminating approximately 15 percent of its employees in a bid to make the company more efficient, shortly after the departure of key employees from the business. Confirmed to employees in an all-hands meeting on Monday, CEO Chris O'Neill advised the company was laying off 54 people. TechCrunch reports O'Neill advised it was part of a plan to refocus its efforts on specific functions, such as product development and engineering. In a note sent to staff members, O'Neill calls the move a "necessary decision to set Evernote up for future success," but also an "extremely difficult decision and one that we did not take lightly." The CEO highlights that he has set "incredibly aggressive goals for the year" over the last few months, but despite noting the company's significant growth so far, he claims "at the same time we invested too far ahead of that growth." The layoffs follow a series of high-level employee exits from the company over the last two months. Key staff including CTO Anirban Kundu, CFO Vincent Toolan, CPO Erik Wrobel, and HR head Michelle Wagner are no longer working for the firm, with existing employees shifting roles instead of Evernote externally sourcing personnel. A blog post from O'Neill intended to provide an explanation to its customers advises new leaders are in place for its Engineering team, as well as for its People and Legal functions, the Product and Marketing teams are united under one leader, and a hiring process has been launched for a new CFO. The post also warns of future streamlining, including in sales, in order to scale other areas. While recent reports point to a company in trouble, including a claim the company is raising more funds, the CEO's note insists otherwise. After growing 20 percent in the first half of the year, the third-quarter revenue is anticipated to end north of $27 million, with Evernote also having over $30 million in cash on its balance sheet and expected to exit 2018 generating more cash than it is spending.